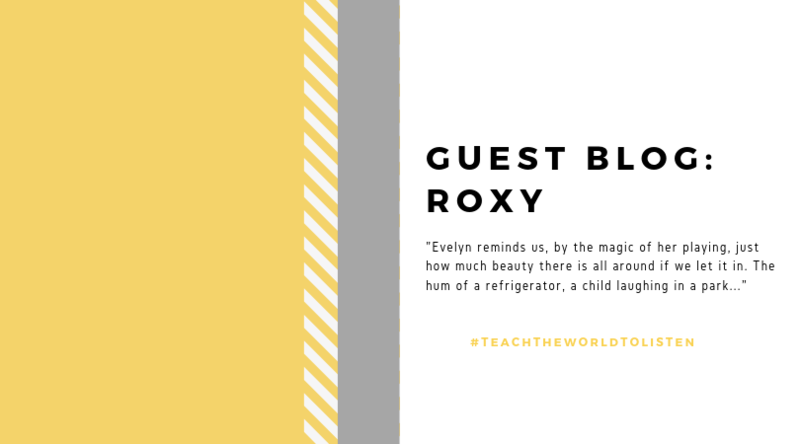 Roxy wrote a wonderful piece about Evelyn and we could not resist to share the story with you! “Beethoven started hearing buzzing noises when he was around 26 years old. Just four years later, when he was 31, he’d lost 60% of his hearing, and at 46 he was completely deaf. In his frustration, he sawed off the legs of his piano to listen to the vibrations of the notes he played. Often, he would sit at the piano, put a pencil in his mouth, touch the other end to an instrument, and hear his music by feeling the vibration of the note. There is something powerfully poignant about a musician losing hearing. Their art is their primary connection to the world, and to lose it is devastating. To hear Dame Evelyn Glennie, who became profoundly deaf at the age of twelve, is to enter a world of magic. Real magic, that you can see. And hear. You can see that she is deaf, because she plays barefoot, to enable her to hear the vibrations. And you can hear magic because her playing is powerful, and every note reminds you of the power of the human spirit. Evelyn says that she wants to teach the world to listen, and she does exactly that, every time she plays. By standing in front of her audience, barefoot, she reminds us all how much we take for granted and how much we miss, in every moment. And her music is beautiful. If you want to be swept off your feet, listen to her perform The Flight Of The Bumblebee. It’s always been one of my favourite pieces of music, but there is a joy in Evelyn’s interpretation that send shivers down my spine in a way that I hadn’t felt before. She plays this demanding, fiendish piece on the marimba, with a virtuosity that stops all mundane thought. It’s breath-taking. Her musical ability is beyond question, but it goes deeper than that. As she says, “My job is listening, and my aim is to teach the world to listen.” This is a laudable aim coming from anyone, but when spoken by a woman who taught herself to listen as a child, the credo gains a truly profound meaning. We go through life barely looking around us, not taking in the beauty of a leaf bud in spring or a sparrow on a fence. We listen even less than we look. We hear traffic but tune it out. We hear our loved one’s voices, but barely notice the sound. Evelyn reminds us, by the magic of her playing, just how much beauty there is all around if we let it in. The hum of a refrigerator, a child laughing in a park. Her TED talk, How to Listen to Music with your Whole Body, is fascinating, in opening the listener up to the magic that happens between the instructions written on a page of music and the performer. Evelyn illustrates her points using her obvious musical mastery, but her most fascinating and meaningful insights come when she talks about the music that is not written on the page. She says it’s the parts that come from a musician’s own life, that can’t be taught, which form the most interesting part of music. These profound insights can be explored through “the tiny, tiny surface of a drum” and form ‘the interpretation’. Evelyn illustrates this beautifully by performing the same short piece she did earlier, when she was simply obeying instructions. This time you can see her hands move with such fluidity and grace and the sound of the drum suddenly grabs you and doesn’t let you go. It is during this interpretation that you see, and hear, the greatness of her talent. Evelyn says, “We all have a right to participate in music”. Her work with children who face a range of challenges that prevent this being a reality in their lives forms an important part of her life. These children need help, and, for them, music can be a particularly potent gift. If you have a story to tell us about the influence Evelyn has had on you, we would love to hear it! Feel free to email it in to pr@evelyn.co.uk and if you wish for it to be on our blog, do let us know. Together, lets #TeachTheWorldToListen.